It’s hard to conceal my ire. I was so proud of how this Reverb cardigan was turning out. The purple yarn was lovely. The pattern was easy to follow. I knew the cardigan would look super-hip on, and would go with most of my wardrobe. But the button band betrayed me. I don’t have any experience with button bands. So far, I’ve managed to avoid knitting cardigans that require buttons. I pretended that I preferred the open look. But the truth is, I was afraid of the button band. And now I know I was right. Button bands are pure evil. Button bands stretch unpredictably and throw off your measurements. 4 inches between button holes. Oops, looks like you have 5. 5 is ok right? Button bands lull you into thinking five buttons will do…until you try on the cardigan and realize you really need seven. Button bands keep you from appreciating your brand new very pretty cardigan because something is just slightly “off”. Button bands are so hard to satisfy. Put the button too far to one side, and the whole thing stretches like a scallop. Which would be nice if that was something I wanted. An artistic statement, prehaps. But it’s NOT. Button bands wait until you have the cardigan all blocked, with the ends woven in, to speak up and tell you something is wrong. Button bands remind you that your stomach is not as flat and firm as your dress dummy’s stomach. They’re rude little buggers. Stupid riggin’, friggin’ button band. Here’s the cardigan. You can see the issues I’m talking about. I guess it’s time to remove the button bands, reknit them, and do the finishing all over again. But not now. Not today. Today I shake my fist at the universe. Tomorrow I’ll take apart my cardigan. You have identified the very reason I haven’t yet cast on this cardigan, even though I’ve had it in my queue for ages. Those button bands in particular seem like a lot of work! That said, your version is really lovely. I love the yarn you chose, and it looks very well made, even in spite of the button bands (which really don’t look that bad from here). I chose one of my more forgiving photos. If you look at it square on its eye bleedingly obvious. Aww thanks. I am hopeful it will all come out right in the end. Poor you! Button bands are tricky, and I avoid them like the plague for the reasons you mention. Another small tip – don’t make them too big because they will stretch over time and then the stupid buttons will keep popping out of their holes and you have yet another issue. Good luck with the fixing! The cardigan will look amazing when you are done. Yeah i was wondering about size. I suppose if they become loose later I could see them up a bit. Very discretely. Oh no… it’s not so bad. 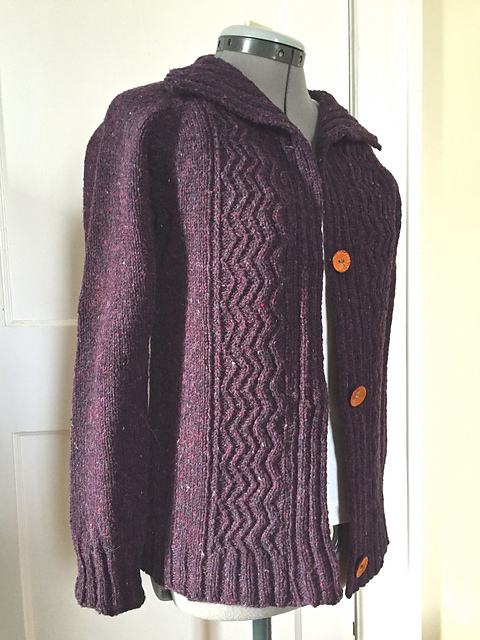 I find it easier to knit button bands by picking up stitches from the front edge, why don’t you do that on this gorgeous cardigan? It won’t interfere with the design. But you may find that you have a bit more control over the band. Take one needle size smaller and make a sample first – to establish how many stitches you need to pick up. There are people who say you should NEVER make button wholes in knitwear, instead you should sew on a press stud and decorate it with a button on top. I think button wholes are manageable. If they are too big or get stretched, just sew them up a bit. You’ll be ok!!! Good luck! Hmm. I assume press studs are the same as snaps? Aww! I have a love/hate relationship with button bands. 🙂 I’ve gone a couple of sweaters with them and have to agree with the previous commenter that mentioned picking stitches up along the edges. Would that help, do you think? It would work, but vertical lines are so much a part of this sweater that it might not look as nice. I’m going to try counting rows. If that doesnt work I may try it anyway, though. I hope you’re able to figure out something. Oh no I don’t care for button bands either. I also had to take apart the last one I made. Good luck. Your sweater looks awesome thou. Girding my loins to tackle it soon. Hopefully this weekend. Lovely cardigan. I once sewed up the fronts of a cardi as I wanted to wear it for a particular event and hadn’t enough time to mess with buttonbands if things didn’t go smoothly. It’s still a jumper! Haha. That sounds like s good solution as long as youcant really tell that t was meant ro be divided. Ugh. I hate button bands for *all* the same reasons. Aw, bummers. Sorry you ran into that. I’m sure you’ll feel more satisfied about them the second time around. Were there any helpful tips on other project pages? The sweater is just lovely. And the color!!! Beautiful. I’m really a novice knitter,but I was wondering about backing the button band with ribbon. I have a couple of store bought sweaters that have ribbon sewn along the button bands. I originally thought is was just for frill, but now I’m wondering if it’s used as a stabilizer. Just a thought. I really have no idea if it would work or if it would mess up the look you’re going for. Good luck with your efforts. Nah. Just be careful. Maybe do the button band first. Then figure out button placement. Then count rows. Then do the button hole strip. Q – the sweater is gorgeous! My first button band was a wavy mess. I can sympathize ! I felt the same until three things combined. Craftsy & Ann Hanson & Buttonbands and buttonholes. She takes you through all of it and makes it so logical. I have a cardigan OTN right now that will require button bands. You have officially made me scared. But I will persevere. Aww, I’m sorry. Hope you get it up to your standards.